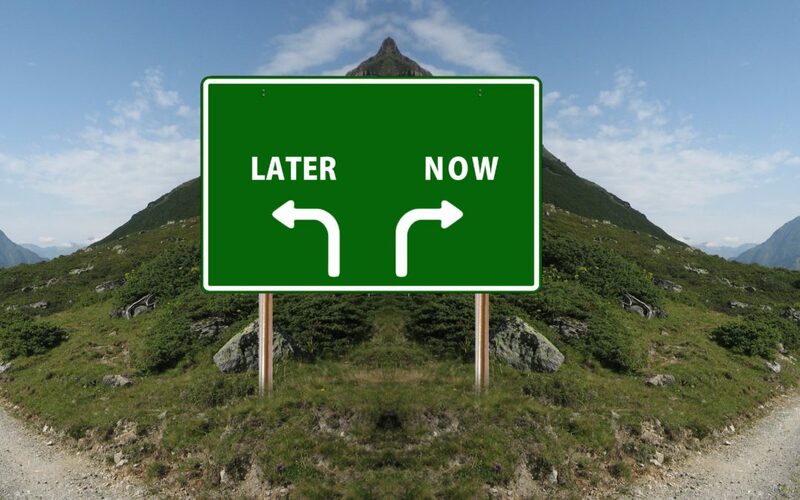 Now Is The Time…to Stop Letting Procrastination Run Your Life! Let’s talk about Procrastination, a habit that wreaks havoc in some of our lives. Whether that surprises you or makes you nod your head in rueful recognition, keep reading! You’ll come away with a better understanding of this happiness-wrecking behavior pattern, plus some ideas for giving yourself a break from it. When you put off “until tomorrow” what you’d planned to do today, it creates an illusion of reprieve and relief; “Ah, good – one less thing I have to do today!” You’ve stopped thinking about it consciously…but in the background you’ve just created a state of stress, tension and frustration. That’s because you’ve just acquired a new burden to carry around and keep track of (and maybe beat yourself up for not having completed yet!). Along with that unfinished task, you also now carry feelings of disappointment and overwhelm, and a sense of perpetual exhaustion. The uncompleted task continues to weigh on you internally. It may interfere with relaxation or sleep, and cause you to feel depressed or anxious. You might postpone or cancel plans you normally would enjoy. Or you might simply walk around feeling the increase of stress in your life. The most important thing to know about procrastination is that it also undermines your self-esteem. Why is that, you may be wondering? Well, just think about your internal dialogs around unfinished obligations. Is your self-talk critical, judgmental and self-deprecating? This kind of internal dialog is never helpful. Instead of enhancing or improving how you feel about yourself (which is the kind of self-talk we should all aspire to, all the time! ), it whittles away at your positive self-image. When your internal dialog is not one you would ever say to a friend, you are actively sabotaging your relationship with yourself. The problem is that when you don’t keep your word to yourself in handling even small things in a timely manner, you reinforce operating in crisis mode, keeping you perpetually stuck in stress, depression, overwhelm and low self-esteem. People tell me that they work best under pressure – it’s how they’ve learned to get things done. However, that doesn’t mean it’s a healthy or compassionate way to manage your days…or your life! Be clear on your desired outcome: What is the task that you want or need to accomplish? Make sure you state it clearly and specifically. Remember that a desired outcome must be what you want, and it must be something over which you have control. Acknowledge how important this desired outcome is. How important is this task, on a scale of 0-10? Is it something that you yourself must do? Or is there another way to get this task accomplished so that it comes off your to-do list? Is there a deadline? Most people operate more efficiently when there is a “due by” date, so if there isn’t already one attached to a given outcome, create one that motivates you. Create accountability: Tell someone in your life what your task is and the deadline you’ve set, so they can support you in getting it done within the time frame you’ve established. You might even ask them to help you complete it, if it’s something that feels overwhelming or stressful. Break the task down into small steps whenever possible. Many tasks and obligations that appear overwhelming or daunting become more approachable, and even appealing, when you can break them down into one doable step at a time. Set up a reward for getting the job done: This step is SO important, but often overlooked! Make sure you are valuing what you do and give yourself credit for getting tasks done. Yes, you deserve validation and rewards for accomplishing your desired outcomes! It might be self-praise, acknowledging with gratitude your feelings of relief and ease, or giving yourself the gift of time off with a friend. Some tasks will require larger rewards than others…go ahead, be overly generous! As caregivers it’s often normal to go from crisis to crisis, which feeds right into the desire to procrastinate on anything that’s not an emergency in the moment. It’s time to learn to take “Option #2” instead – to take that breath, inject some intentional self-care into the moment, and realize that all procrastinating will accomplish is to set up a crisis later, undermine your mood now, and sabotage your overall health and wellbeing. That is a recipe for accomplishment, self-respect and more ease and satisfaction every day of your life as a caregiver. Leave your questions or comments below – I look forward to hearing from you! For added guidance and support on your journey to take as good care of yourself as you do of those you care for, check out my new book, Take Back Your Life: A Caregiver’s Guide to Finding Freedom in the Midst of Overwhelm. You can even get the first chapter free and start using it today!